Multimodality imaging, such as PET/MRI and PET/CT, is an emerging research field. In PET imaging, attenuation correction (AC) accounts for the radiation-attenuation properties of tissue. It has been established that PET images reconstructed without attenuation correction can introduce severe artifacts. Attenuation correction is mandatory in order to obtain PET images that are sufficiently accurate for quantification. Usually, in stand-alone PET scanners, the attenuation correction is obtained from a transmission scan using one or several moving sources. In combined PET/CT, the attention correction is derived from the CT information. Unfortunately, CT does not provide the excellent soft-tissue contrast that MRI does, it adds a significant radiation dose, and it does not allow truly simultaneous imaging. In the case of a PET/MRI scanner, there is insufficient space for a rotating source and the attenuation map must be determined differently. Ideally, one would like to obtain the attenuation map directly from the anatomic MR images. In our group, we developed an MRI-based attenuation correction method for PET imaging. As shown in the following figure, the graphical user interface (GUI) includes all adjustable parameters in the algorithm and can show the processing result at every step, thus allowing users to easily test and use this algorithm. The program can read and show MRI, PET images, and sinogram. 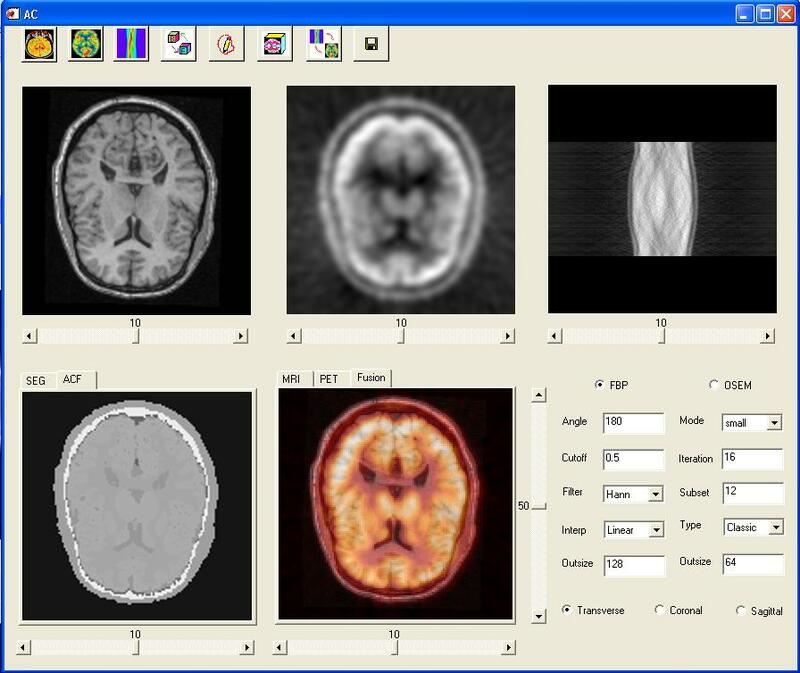 It can display segmented and classified MRI images, registered and fused PET/MRI images, and attenuation maps. It includes FBP and OSEM methods for reconstruction. This software program can be directly used for many combined PET/MRI applications. Figure 13. The MRI-based attenuation correction software.